Brian Byrn didn’t step into an art museum until he was 18 years old, but art was very central to his upbringing nonetheless. He was born and raised in Corydon, Indiana’s original state capital, so he spent years playing on the Constitutional Elm and walking around the historic architecture in the town’s downtown area. His family spent hours telling stories about history and sometimes their own memories. His mother collected antiques. Now, Byrn takes care of 6,000 pieces of historical artwork as the curator and director of the Midwest Museum of American Art on Elkhart’s Gateway Mile. As a child, he wanted to be an architect, but a low SAT score changed his path. Byrn took a drawing class in college and was immediately hooked. He was 23 years old in 1981 when he arrived in Elkhart and got married. He planned to move to Chicago by the end of the year. Then he entered the 3rd Elkhart Juried Regional Competition at the MMAA. “I walked in that night and there was a few hundred people in here. They said, ‘Brian Byrn won Best of Show’ for my series called Madonna and Child Enthroned in Indiana,” he said. The series featured his then-wife as the model for Madonna. It was hung in the museum for the public to see. Museum co-founder Jane Burns hired Byrn to be the museum curator on November 18, 1981. He succeeded her as director when she retired in 2015. 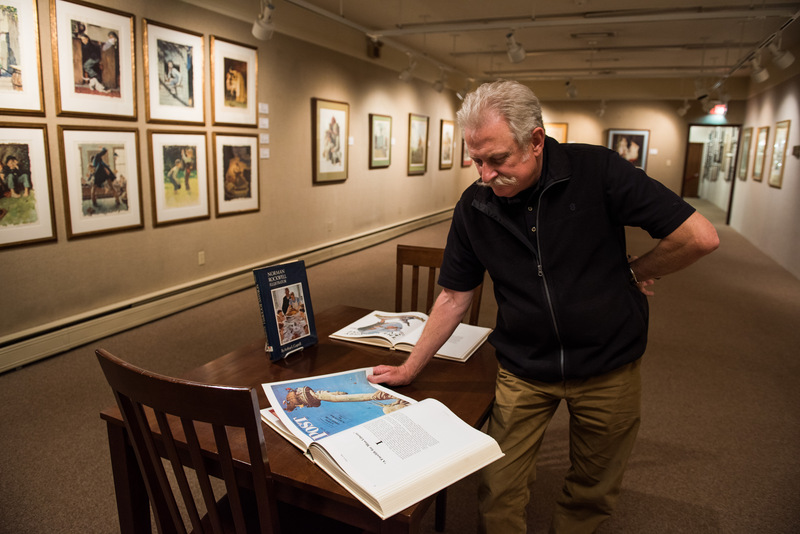 Byrn is proud of the museum’s collection of more than 6,000 pieces, including paintings by Norman Rockwell and Grandma Moses. “Our pieces are heralded by large museums and requested for loans. Their curators think there’s a standard procedure (for loaning artwork here). We’re just two people,” Byrn said of the staff. 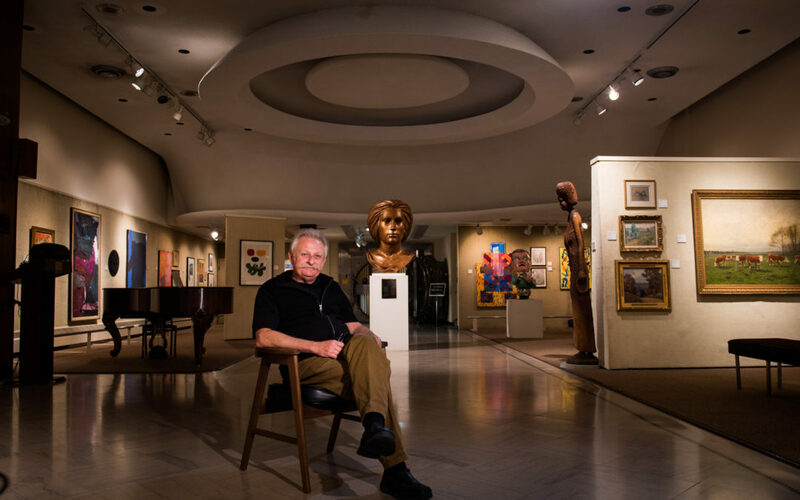 Administrative gallery coordinator Randy Roberts is the only other paid employee of the Midwest Museum of American Art, which runs on an annual budget of $250,000 or less. Rather than pay multiple employees, Byrn uses the majority of that budget to pay for the costs of keeping the museum open, preserving the art and bringing new art to Elkhart County. About 50 people walk through the museum’s doors each of the six days a week it is open. The museum is funded by admissions, memberships, corporate support and donations. It receives no public funding through tax dollars or grants. Byrn says most of his job has been creating an environment where adults can reconnect with their senses of imagination, vitality and enthusiasm for art. Photo by Jason Bryant. In addition to curating the museum’s collection, Byrn is also heavily involved in the art scene throughout the county. Most recently, he helped the Elkhart County Convention and Visitor’s Bureau bring the Seward Johnson collection of statues to the county. He chose which statues would be at each Quilt Garden and town. There are almost 60 sculptures places around Elkhart County, including one of Marilyn Monroe inside the MMAA itself. Byrn sees his job as more than taking care of the art, curating the collection and organizing exhibits. He wants to expose more people to art, especially adults. “Children fear no art, they love art. They respond to it. And somewhere along the line, we get all that imagination and vitality and enthusiasm drained away from us. Most of my job has been trying to bring that back for people,” he said. “It’s about an experience. The MMAA has been in the same building since it opened on Main Street. Despite economic ups and downs, it has thrived. The Elkhart Juried Regional Competition has grown into what Byrn calls “the Oscars of the art world in Michiana.” Artists from 22 counties enter to win $35,000 or more in awards every October. More than 300 people attend the opening night festivities. “It’s very work intensive. It’s our biggest show of the year and we put the most labor hours in, but when we roll out the red carpet and put the search lights out front, people are crazed for it,” he said. Byrn is working with the museum’s five trustees to chart the museum’s course for the rest of the year and set it up to be sustainable and successful in the future. The collection will evolve to meet the needs and desires of the greater Elkhart County community and bring in new audiences, he said, and the staff will grow as needed. In the mean time, Byrn is simply grateful to get to steer the museum and contribute to the culture of Elkhart County.